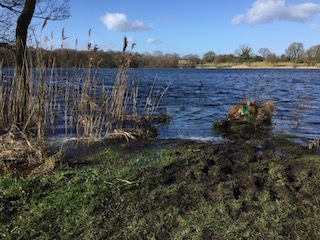 Had a session on my runs water yesterday after my plans to go to the Welsh Lake were scuppered by the forecast of 55mph winds hitting the area. I arrived to find every platform under water with the level up a good 12" on my last visit. 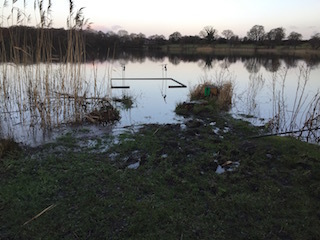 I opted for a peg that had a platform that is shorter and slightly higher so it only had about a 4" covering of water on it. My thinking was that I'd be less likely to slip over and have an early bath on the shorter platform as I only had my thermal moon boots which fortunately are waterproof. Runs were from the off again and by 10:30 I'd had 9 runs and landed 5 fish, nothing big with the best at 8Lbs 14oz. The wind then got up to the point where I couldn't cast out to the deeper hole as the wind was pushing that strong right into my face. I had a couple more dropped runs but the wind was proving to make fishing increasingly impossible. 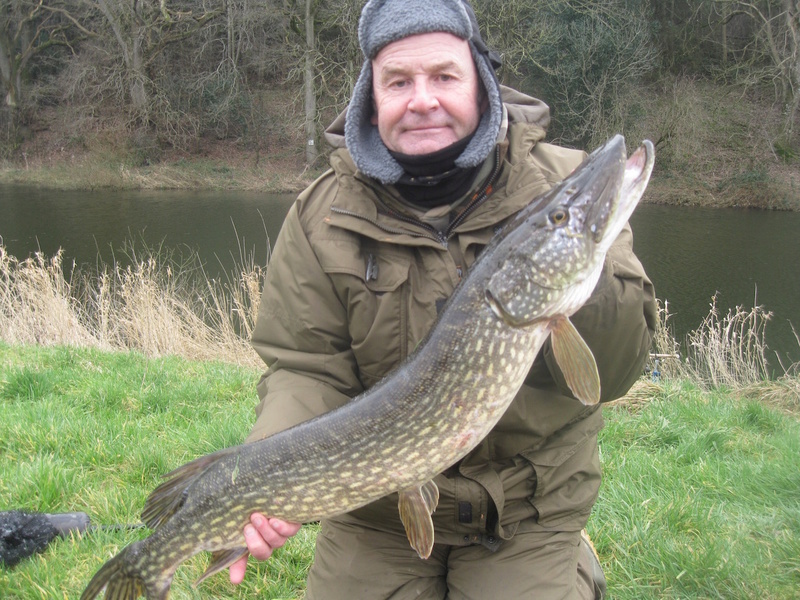 I contemplated a move to a more sheltered area but another couple of Pike anglers had arrived and after fishing further up the bank I was on, they headed to the swims where there was some respite from the wind. I'd had enough by 13:30 and with the wind showing no sign of blowing itself out, I packed up and headed for home. The Pike all looked ready to spawn on here today and as soon as there is a slight increase in temperature I'd expect them to do the deed, so it'll be my last session Piking on here this season. It's been enjoyable and has certainly served it's purpose as a confidence booster this winter. Hopefully I'll squeeze a couple more sessions in Pike fishing somewhere over the next couple of weeks before switching to overnight sessions after Carp and Bream. Another slow day yesterday just two jacks better than a blank. Yes, it is we all hate blanking. I had a look through my old diaries - I had to go back ten years for a season in which I have not had at least one twenty pounder. I have ordered some bait from Angling World should be here Friday looks good on the web site. 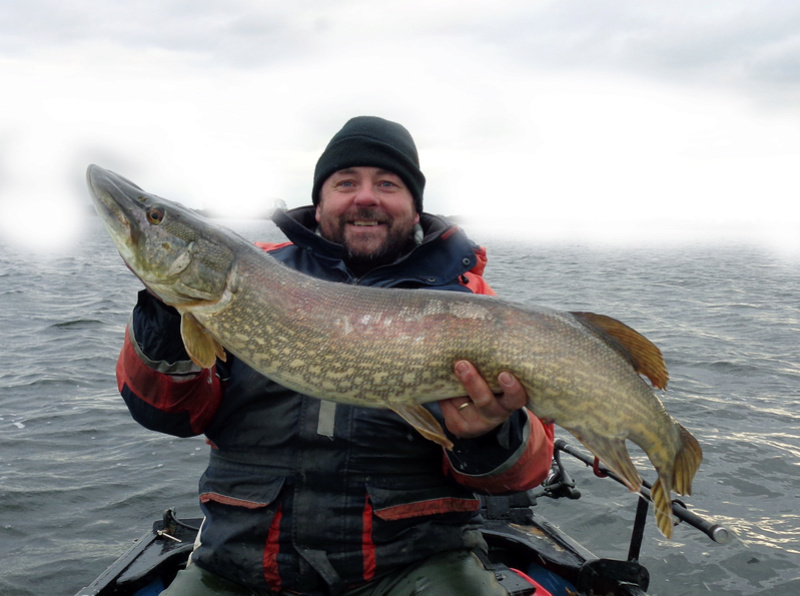 I've a week booked in Scotland mid March so there's time to catch a big fish yet. Had a day on a club water yesterday. I arrived at first light and headed straight up the far end of the lake. My plan was to bait 3 swims with chopped fish and fish them alternatively. 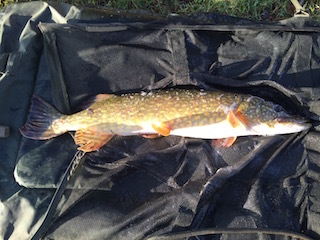 I started in the middle swim and was contemplating moving to my next swim when the Sardine rod was away, you get a good view of the fish in the clear shallow water on this lake, so I could see it was double straight away and on the scales it went 12Lbs 6oz. I tried both other swims and didn't have a bleep so back in the middle swim and the Bluey rod was away with a small Jack of about 4Lbs that I was able to unhook in the water. 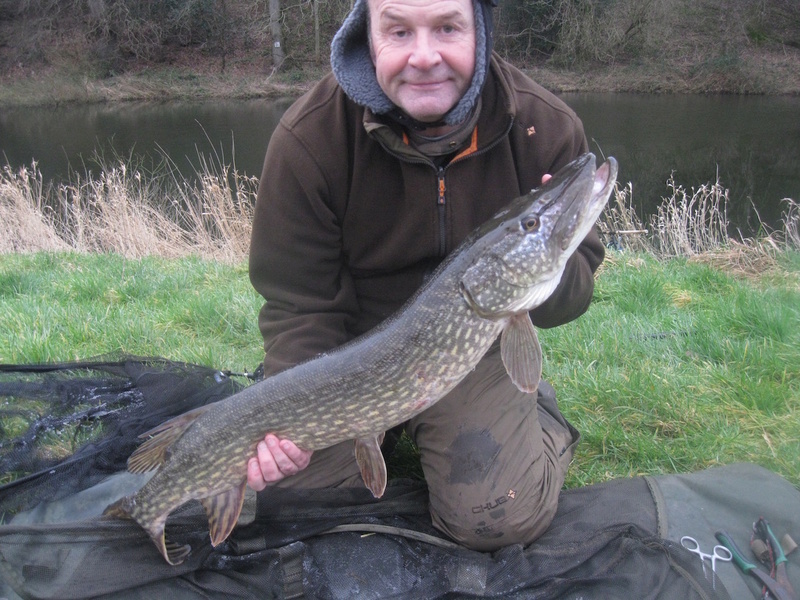 Same routine, try the other swims for zilch, back to my middle swim and within 30 minutes I had a Jack of around 6Lbs. I gave it another go in the other swims after chucking a bit more chop in all of them, but again nothing on either swim. I decided then that I'd sit it out in the middle swim and was rewarded with the same fish at 12Lbs 6oz i'd caught in the morning That was first for me, I've had plenty of repeat captures but not 6hrs apart. 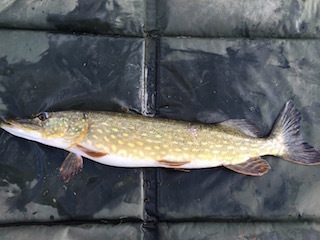 I managed 2 further runs from the middle swim but the hooks pulled on both of them, although I did see them in the clear water and both were small Jacks. Not a bad days fishing for this water considering it was a bitterly cold day and it has a reputation for being a right moody, head scratcher at times. Same fish caught 6hrs apart. After studying the pictures, I'm pretty certain I had it last season twice at 12Lbs 12oz, although that time it was over a week apart. With the weather for the week looking bad we decided to go out yesterday. Unfortunately we blanked six rods eight hours not a touch. On a positive note it was a nice day as we sat there putting the world to rights. Now that's what I call snow. I am hoping that all the snow will be gone by next week and I can get out to fish at the monent you can't get anywhere. Snowed in today lads, at least 12" and -8 at the minute. 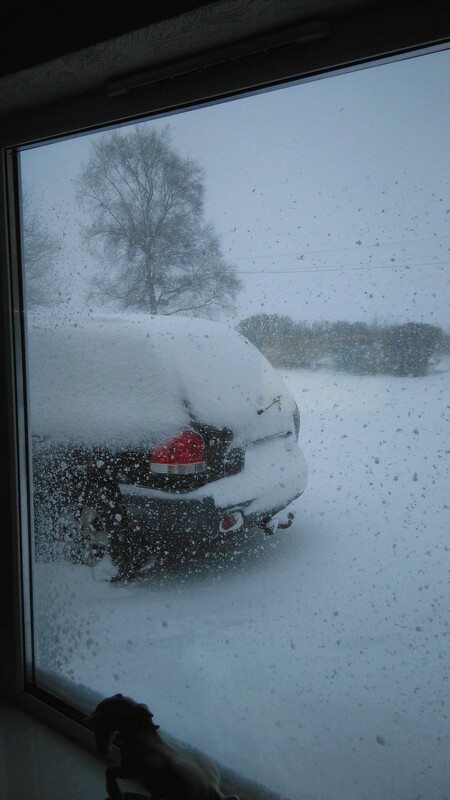 psion wrote: Now that's what I call snow. 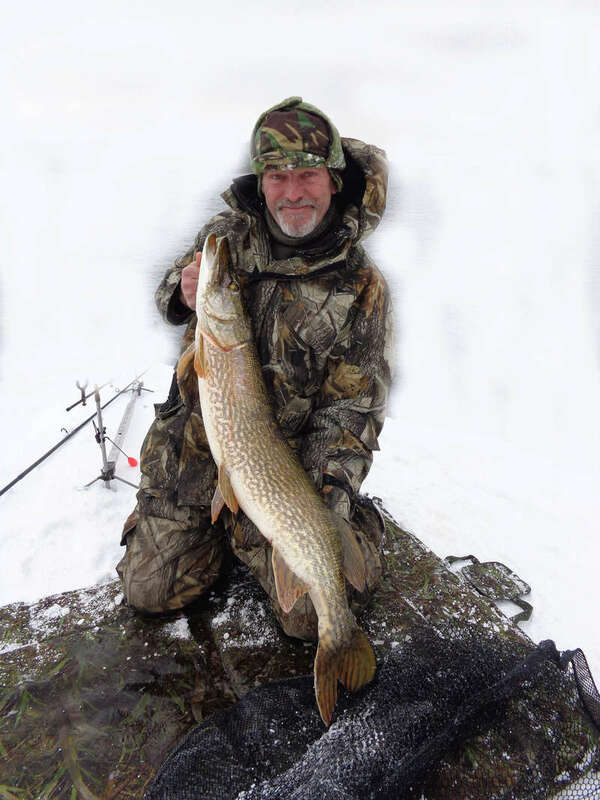 I am hoping that all the snow will be gone by next week and I can get out to fish at the monent you can't get anywhere. I have booked 5 days in Scotland starting 10th of March. I am hoping the weather's better by then. At the moment I am mostly building a massive pile of snow halfway down the drive clearing the 18-24 inch snow drift that seems to appear three times a day. Still looks pretty serious there though Andy! Spent an hour plowing the half mile of estate road from our house to the main road with my daughter. She really enjoyed it and I have to admit that I love plowing snow!